Whenever we get a chance to walk the Northern Camino, we can’t wait to visit Bilbao. This picturesque modern city has become a hub off Spanish insurance companies, banking and industry. Don’t let this put you off visiting as part of a holiday, Bilbao is not all suits and briefcases! The city retains its amazing culture and the prosperity of the area has led to an influx of trendy new eateries, attractions, bars and cafes. 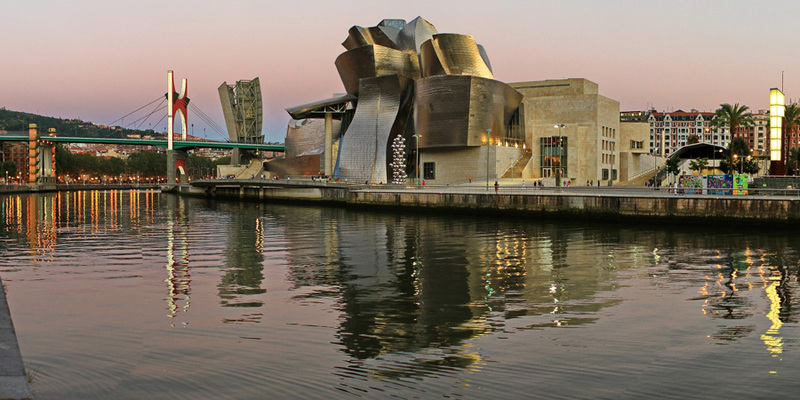 The Guggenheim is world famous and is synonymous with the city of Bilbao. The artwork begins with the architecture of the stunning building and the sculptures that surround it. Inside The Guggenheim’s uniquely constructed walls you’ll find exhibitions by the world’s greatest modern artists. This place is mind blowing. The Old Town in Bilbao is know as Casco Viejo (The Seven Streets). These streets are jam packed with personality, and really capture the character of Old Bilbao. Take a break and chill out in one of the traditional Basque cafes or restaurants. The two theatres in Bilbao, The Arriaga Theatre and The Campos Eliseos Theatre stare across the river at each other. They are glorious to view from a distance, and you can also catch some great shows inside! El Ensanche is an upmarket neighbourhood, that is located on the west of the City. The wide streets of El Ensanche are lined with old town houses. This is a shoppers metropolis, home to famous fashion house brands. Try to be conservative with your credit card, as some of the fashion is as irresistible as it is expensive! Santiago Cathedral is the crowning glory of the old quarter in Bilbao. The Gothic style building is named after St. James, patron saint of Galicia and star of the Camino de Santiago. Spotting the scallop shell in the Cathedral will remind you that although you’re exploring this fab city, you’ve got walking to do! 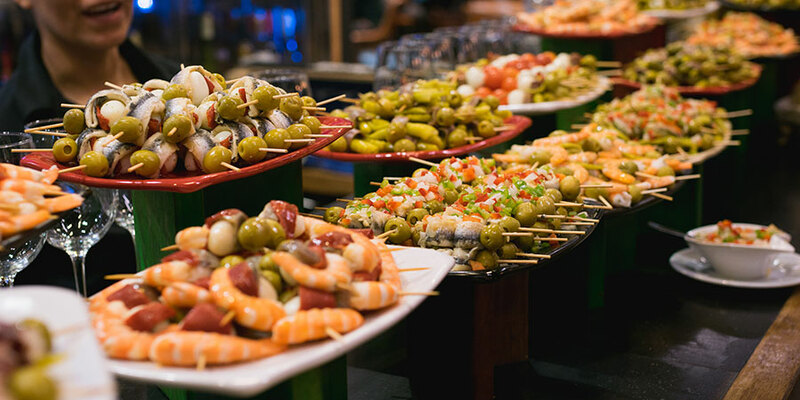 You may have heard of tapas, and Pintxos is very similar. Our tip is to visit a couple of bars and get a miniature meal with a drink. The Basque region is famous for its cuisine and this is the ultimate method of tasting the biggest variety of food in a limited timeline. It’s not often that a football club makes a CaminoWays.com list but the heritage of Athletic Bilbao is admirable to say the least. The club have managed to stay at the top of Spanish football despite limiting themselves to only employing Basque players since 1912. This celebration of Basque Nationalism is testament to the club and its community. A cable car, Bilbao Funicular, takes you from the city to Artxanda Lookout. This vantage point towers 250 metres above the city, allowing you to spot all the sites we’ve listed from a birds eye view. The green mountainous backdrop should be another remainder that the trail awaits you. Vizcaya Bridge is a UNESCO heritage site, so you know it’s got something special! 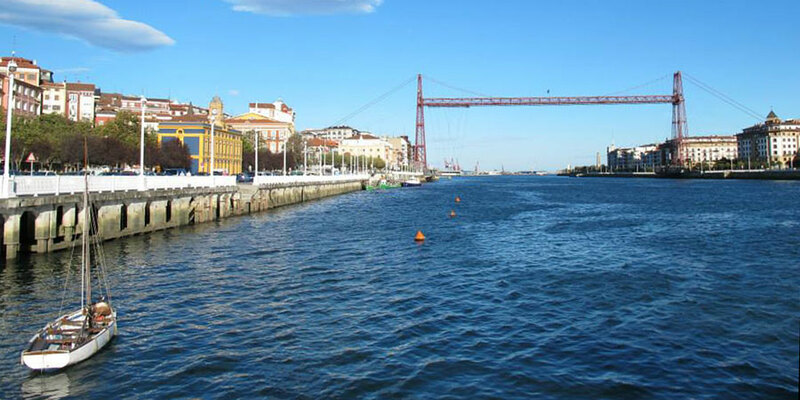 The world’s oldest transporter bridge connects two sides of the city across the Nervion River. The structure is a prime example of industrial ingenuity in the nineteenth century and still operates today. Bilbao’s rich fishing culture is celebrated in this epic museum. Local boat owners get involved in the free exhibition area, showing off their handy work. Essentially its an open- mic for ships, and the sense of community is obvious to everyone. Pop down and learn why the seafood you’re eating is so tasty! For more information on visiting Bilbao as part of one of our Camino del Norte walking or cycling tours, contact our travel specialists.